Is PlayLottoWorld.org a Scam or Legit? Read Reviews! 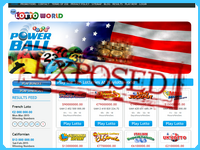 PlayLottoWorld.Org Exposed — Who Doesn’t Dream of Winning? Who doesn’t dream of winning the lottery and getting instant cash? That’s playlottoworld.org’s tag line, and maybe they do have it right. Play Lotto World is an online lottery provider that offers tickets, subscriptions, and syndicates. They offer all those lovely big mega jackpots and make it easy to get in on winning. Want to know more? Let’s take a look. Play Lotto World offers tickets online for the usual big international lotteries including Italian National, UK National, US Mega Millions & Powerball, Californian, Spanish El Gordo, Oz Lotto & Powerball, Euro Jackpot & Millions, French Lotto and Brazil’s Mega Sena. There is a minimum purchase of lottery tickets, usually five per draw. They do offer a 100% bonus on the first tickets purchased. There are a few gimmicky things that this site offers. One of them is bundling. That’s where a player chooses a group of lotteries to play from a week up to fifteen weeks. Tickets are all quick pics so you won’t be playing your favorite numbers here, but they do offer it as a great deal. Playlottoworld.org also offers syndicates for most of the big jackpot lotteries. They set out the limit on shares, and this also can be set up as a subscription – meaning you can buy multiple weeks. Their rules and regulations on this are clear, and players understand what they are getting as in how many shares and how many people they are going to have to share that mega win with. Playlottoworld.org offers a bunch of different promotions. Let’s start at the 100% welcome bonus. That means you get twice the tickets you initially purchase. Next is their offer for every 10th ticket purchased is free. They also offer discounts on their multi-draw bundle packages ranging from 15% to 25%. Playlottoworld.org is operated by a company called Webgroup Inc. based in Panama City, with their head office in London. They have a sister site, Playlottoworld.com, which offers similar services. These guys have been around for a while, and given the lack of complaints, they must know what they are doing. Would you mind rating PlayLottoWorld.org ? Playlottoworld.org is pretty straight forward in what they offer and what they deliver. It’s pretty easy to move around their site and find info. They offer a wide range of products and different ways to get in on the game. Don’t forget these are one of the guys that provide promotions. If you are playing here, please tell us about it. And of course, please let us know if you hit that mega jackpot. You don’t have to give us your real name, but please do let us know how you do. Okay I like the bundling concept but I don’t like the fact I have to take the numbers their system chooses versus favorite numbers. The promotions are good especially the fact that it doesn’t come with the ole FPP system so I don’t have this ongoing concept of what I’ve spent. But, not enough to convince me to move from my current provider.